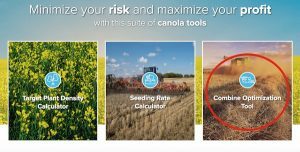 The combine optimization tool, developed by the Prairie Agricultural Machinery Institute (PAMI) for canolacalculator.ca, will help farmers set the combine to keep losses as low as possible while finding a balance with productivity and grain quality. The combine optimization tool takes the traditional diagnostic settings flowchart and puts it into a web-based application you can access on your phone. Growers can go through a step-by-step process based on the harvesting issue they’re experiencing (i.e. grain loss, grain sample quality or productivity) and review the adjustment options most likely to correct the issue. WEBINAR Mark the calendar: CCC Agronomy Specialists Angela Brackenreed and Shawn Senko and PAMI’s Nathan Gregg will present a Combine Optimization Tool webinar on Thursday, August 2 at 10:00am CDT (Manitoba time). Use this link to view the webinar. Log in a few minutes early to load the webinar software and make sure your connection works.